Earlier this year, Massive Attack announced that they had encoded their 1998 album Mezzanine into DNA to mark 20 years since its release. 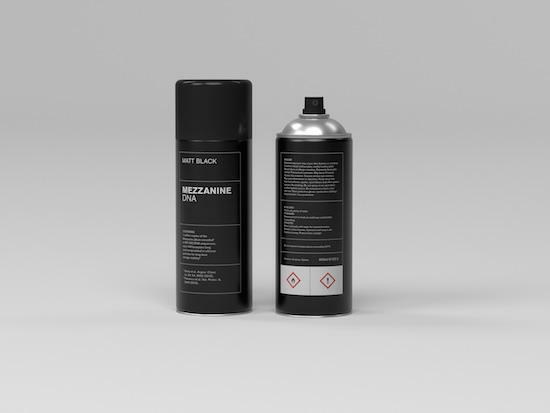 Now, they've got other plans for the album, revealing that Mezzanine will be made available in the form of a matt black spray paint can. A press release announcing the plans says that parts of the encoded DNA will be included within the matt black paint in the limited edition spray cans. Each can. the announcement says, will contain millions of copies of the record. "It's a creative way to store your back catalogue, although DNA-encoded spray paint is unlikely to be adopted by street artists seeking anonymity," says the group's Robert '3D' Del Naja. Dr Robert Grass of Zurich-based company TurboBeads, who's been involved in the creation of the spray cans, explains how they came about. "This digital bitstream of the album (0s and 1s) was first translated to 901'065 DNA sequences (A, C, T and Gs), each 105 characters long," he says. "The 901'065 individual sequences were then chemically synthesised resulting in a synthetic DNA sample, which fully represents the digital bitstream of the album." It's long been speculated that Massive Attack's Del Naja is in fact famed anonymous street artist Banksy, and the press release announcing the spray can format describes Del Naja as "a graffiti artist". We'll let you make of that what you will. For Massive Attack fans who'd like to bag Mezzanine in a more easily listenable format, they'll be reissuing the album next month along with a clutch of unheard remixes by Mad Professor.